Ben Carson, Donald Trump, and SNL: Will the entertainment ever stop? What is and isn’t funny anymore. 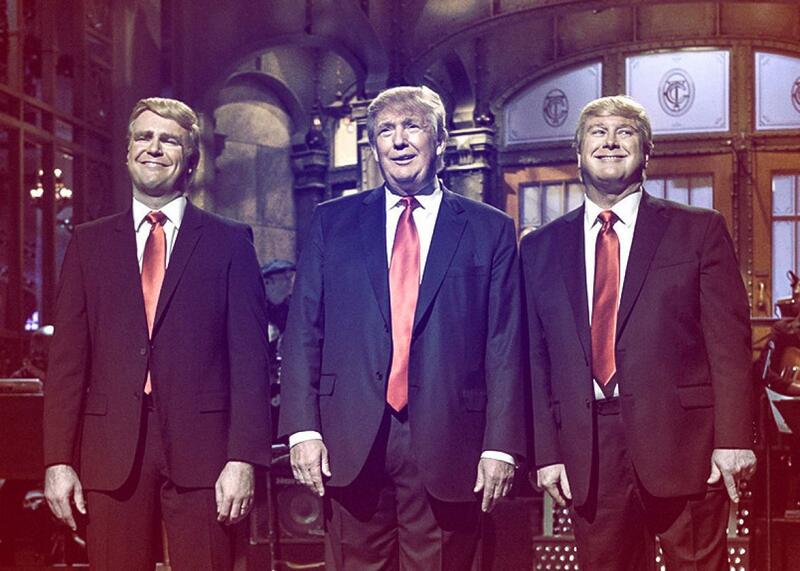 Taran Killam, Donald Trump, and Darrell Hammond on Saturday Night Live on Nov. 7, 2015. Photo illustration by Slate. Photo by Dana Edelson/NBC/NBCU Photo Bank via Getty Images. Podcast for America is your inside look at which presidential candidates may or may not have assaulted people. Your hosts are Annie Lowrey of New York magazine; Alex Wagner of MSNBC; and Mark Leibovich, national correspondent for New York Times Magazine. We’ll ponder the horrible, terrible, very weird week where Ben Carson claimed to have attacked a friend and whether much of what he says about his biography can even be believed. Next, we’ll examine criticism brought by Carson and other GOP candidates about the vetting of presidential candidates and just how one-sided it might be. And Mark gives us his take after sitting in alleged spitting distance from Donald Trump himself at Saturday Night Live.